Abq Jew Gets Around: As a much younger Woody Allen used to say, "Ninety percent of life is just showing up." Some think this high percentage grants too much power to the people; nevertheless, the quote stands. Has Abq Jew mentioned that he was brought up in (northern) California - back when California was truly the Golden State? Note: Abq Jew never claims he grew up in California, for (he believes) no one really grows up there. You want proof? Here are The Beach Boys! Most are still among the living; many are still performing. So where has Abq Jew been getting around to? Funny you should ask. Sunday September 11: Rabbi Stephen Landau presented Me, The Jews and The World, Part 1 of a two-part lecture series, to a small but enthusiastic group of WestSiders meeting at Case de Shalom in Rio Rancho. Rabbi Landau - if you don't know - is now on staff at the Solomon Schechter Day School of Albuquerque. He is a traditionally trained, spiritually and pluralistically oriented rabbi who brings pastoral counseling and cantorial skills to SSDS Abq and to Jewish New Mexico. Haven't met him yet? Abq Jew thinks you should! 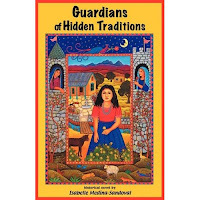 Sunday September 11: Isabelle Medina Sandoval and Diana Bryer presented Crypto-Judaism in Literature and Art as a New Mexico Jewish Historical Society event at Nahalat Shalom. Isabelle and Diana dialogued about their collaborations and creative endeavors, as they relate to Diana’s paintings on (among others) the Rosa de Castilla. Sunday September 18: Rabbi Stephen Landau presented One Night, Standing Together, Part 2 of the two-part lecture series, to a still small but still enthusiastic group of WestSiders meeting at Casa de Shalom in Rio Rancho. Sunday September 18: Rabbi Chaim Schmuckler of Chabad presented 9/11 Kabbalistic Insights, a far ranging lecture that focused on Jewish prophecies regarding our turbulent times, which prophecies must come to fruition, and what we can do to make things good for all mankind. Also attending - Abq Jew had the pleasure of meeting the wonderfully generous member of the Abq Jewish community who has invited anyone without family or a place to go for a Homemade Shabbat Dinner & Oneg at a private 87122 home. Call (505) 238-9750 for details. Wednesday September 21: Author and historian Naomi Sandweiss presented Jewish Albuquerque 1860-1960 at Congregation Albert, as part of CA's Lifelong Learning program. An Albuquerque native and longtime New Mexico Jewish Historical Society volunteer, Naomi used more than 200 images from public archives, congregational collections, and individual and family collections to illustrate the city’s fascinating Jewish history. Self-Promotion Alert: Abq Jew is happy to announce that his article Like It Was Yesterday: Remembering Magidson's will be published in the September 2011 issue of Legacy, the NMJHS newletter. Thursday September 22: Rabbi Stephen Landau presented A Season for Renewal: Preparing Our Hearts for the High Holy Days, an online lecture by Rabbi Arthur Green, at SSDS Abq. Streamed live from Hebrew College, Rabbi Landau's alma mater, this venture was beset by technical difficulties - yet still notable. The technical issues should be resolved way ahead of the next lecture, Light & Shadow: Mystical Teachings on Hanukkah, on Wednesday December 14. Abq Jew gleefully notes that yes, this was another Rabbi Landau event, and that yes, Rabbi Landau is trying things to liven up Jewish life in Albuquerque and beyond. Remember: "Ninety percent of life is just showing up." What a wonderful thing, to be conscious! I wonder what the people in New Jersey do.